The next band I’ll be writing about is Lindisfarne. I must have seen Lindisfarne more than 20 times over the years, including the legendary Christmas concerts at Newcastle City Hall, and at many festivals. I’m starting today with gigs I attended in Newcastle, Sunderland and at festivals during 1971 and 1972. I’ll reflect a little about those gigs today, and I’ll then move on to their 1972 UK tour which featured Genesis as support, Lindisfarne Mk II (1973 – 1975), the comeback Christmas concerts ay Newcastle City Hall in 1976 and 1977, the full comeback in 1978 and success with Run For Home, the ongoing City Hall Christmas concerts (1978 and into the 80s), and the sad farewell in 2003. Whew! That’s this week of blogging mapped out! I first saw this band at Newcastle City Hall on a Charisma package tour, which featured Van der Graaf Generator, Lindisfarne and Genesis. The tickets were all of 30p, and we had some Northern Arts vouchers from school which entitled us to half price entry, and meant we paid 15p each! We hadn’t seen any of the three bands before and were really excited about it. The place was completely packed and we only just managed to get in. In those days, when the hall was full, they would let you sit on the stage on tiered choir seats behind the performers. This became a tradition for Lindisfarne in particular and that’s where we ended up that night. First up were Genesis, who were just great; this was the era of The Knife and the Musical Box, but it was Lindisfarne who stole the show that night. Unbeknown to us they were already local heroes and had everyone singing along with Fog on the Tyne, Meet me on the Corner, Lady Eleanor, and Clear White Light (my favourite along with Winter Song). The band was yet to break through big. We found headline band Van de Graaf Generator quite strange and somewhat difficult to get into, although Killer and Refugees have become favourites over the years. A great evening, a bargain at 15p :), and the first of many great nights that I would spend with Lindisfarne over the next 30+ years. I then saw Lindisfarne at Sunderland Top Rank, which was another packed night, with support from the excellent Capability Brown; I remember Clear White Light was the encore in those days, and I can picture the packed ballroom singing along, everyone on tables and chairs, hands in the air. 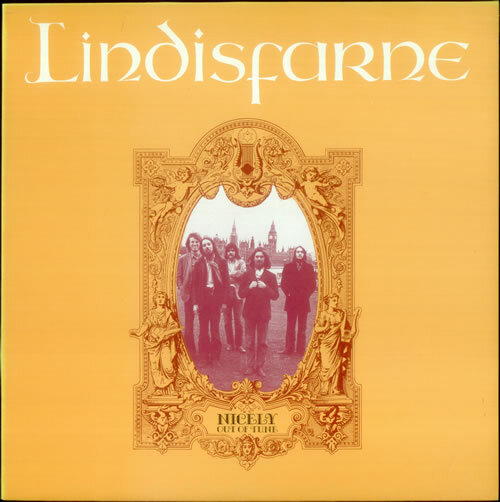 Lindisfarne were also great festival favourites and I saw them steal the show on a couple of occasions at open air events; at the Lincoln festival in May 1972, and again at the Grangemouth pop festival near Edinburgh in late 1972. This was the classic line-up of Alan Hull, Ray Jackson, Rod Clements, Si Cowe, and Ray Laidlaw. The band really were at the top of the game during this period, and couldn’t be betted as fun-time live act. They had two excellent albums under their belt; Nicely Out of Tune (1970) and Fog on the Tyne (1971), and a clutch of great sing-along tunes. A Lindisfarne concert at the time incuded No Time To Lose, January Song, Meet Me On The Corner, Alright On The Night, Train In G Major, Scotch Mist, Lady Eleanor, Knacker’s Yard Blues, Fog On The Tyne, We Can Swing Together, and Clear White Light as encore. Their 1971 December City Hall concert was recorded and released as a live album in 1973, and shows the band at their live best. You knew what to expect when you went along to a Lindisfarne concert in those days: great humorous stage banter from Alan Hull and Jacka, singalong songs that we all knew the words to, classic folk-rock with mouth harp and violin, some rock’n’roll, beautiful harmonies particularly on Clear White Light, and the haunting Lady Eleanor. Tomorrow I’ll write about the 1972 tour, which featured Genesis as support, and was in support of their third album Dingly Dell. The tour called at the City Hall for two nights, and I went along to both concerts. Saw Lindisfarne at Top Rank Watford on 18th Oct 1972. Support act was Genesis; Peter Gabriel was dressed as a fox. 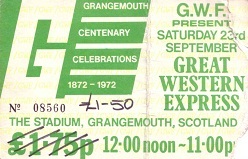 Hi, yes I was there also, seems incredible, that genesis was the supporting band when they went on to be so successful.